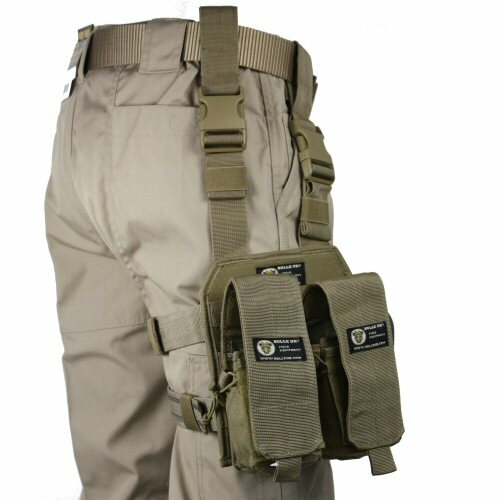 Tan MOLLE drop leg panel combination with two rifle magazine kangaroo mag pouches. The assembled parts shown in the photograph show the side-by-side arrangement of the two pouches. The drop leg panel is multi-layered, with two layers of Cordura nylon over a semi-rigid foam board for stability. The panel measures approximately 19cm wide and 21cm tall, with the corners at the top edge cut away to prevent rubbing on the upper leg. 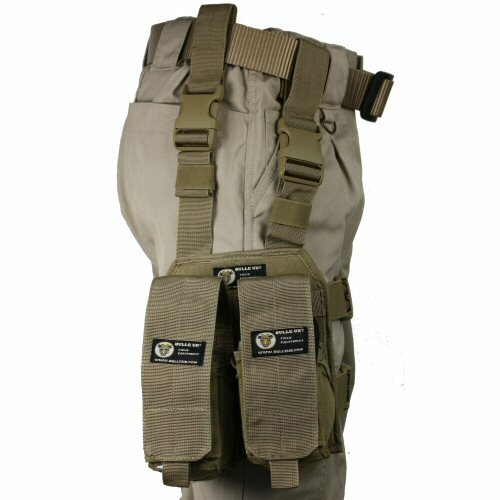 The panel itself has 3 horizontal MOLLE webbing straps across the front for mounting of pouches, spaced at 25mm intervals, and are stitched at 35mm intervals vertically with reinforcing stitches top and bottom straight through all the layers of the panel. The panel is ambidextrous as the thigh straps can be fully detached and remounted for either leg. The thigh straps are fitted with 40mm wide double layered elastic for movement. 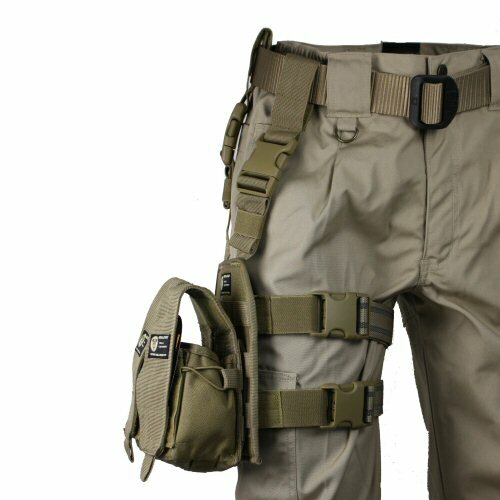 The two thigh extender straps are 40mm wide, which attach to the provided belt keepers for quick and easy removal. Each rifle magazine kangaroo pouch is adjustable from 17 to 22cm tall, 7cm wide and 8cm deep for three NATO M4 magazines, two AK magazines or two G36 magazines. The front of each pouch has two smaller pockets measuring 10cm tall, 3.5cm wide and 2.5cm tall and these are faced with velcro for the lid to close onto. The lid encloses over the top with velcro and can be stowed open with an additional panel of velcro on the inside of the lid. To provide double security and compress the pouch when the full volume is not required, an adjustable shock cord runs across the top of the body of the pouch and can be toggled down with the provided toggle. Made of 1000D Cordura nylon. Angled rear view of the pouch, showing the shock cord and toggle which help to compress the contents. Front view of the pouch showing the quick release buckles on the front of the thigh straps. The magazine pockets are fully filled to their depth.